Bringing 3 children along the trip can be quite a handful so we decided to join the half day island tour in order not to drain away all our energy. 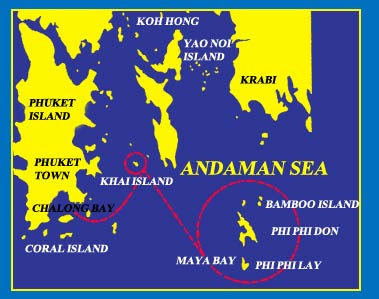 Instead of going to the popular Phi Phi Island, we decided to explore Khai Island. We paid 850 Baht each for adult & 750 Baht each for children 3 years & above, which we found quite reasonable (inclusive of land transport, speed boat, light lunch, drinks & fruits). We needed to pay 100 Baht for each pair of flippers we loaned. Of course, the tour guide loaned life vests & goggles to us for free (we still have to bear the cost if we lost it). We only stayed on this island for an hour. Oh well...obviously only hb & YS dared to jump into the deep blue sea. I chickened out & took my own sweet time to take pictures. They were resting under a nice cool shelter, each umbrella + 2 deck chairs cost us 150 Baht. There were other vendors selling ice-creams & other cool drinks to make money from tourists. At the end of the day, almost all of us went back sun burnt. They were burnt by the sunlight but I was burnt by the sun block lotion (due to skin allergic reaction). Ok...basically we were having a relaxing holiday. We did not explore much area this time but it was a good break for adults. One thing for sure, Junior YS is now very good at saying "Sawadee kap...cup cup cup!" haha! So cool.. going to Phi Phi island for swimming. We may go there next time when the kids are slightly older. Wah, need to pay for deck chairs & umbrella?? Haha... Interesting!